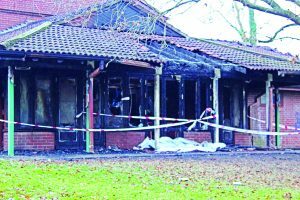 SERVICES for young people provided by the fire-damaged Lakers Youth Centre in Goldsworth Park will carry on, youth workers have pledged. They are looking at alternative places to hold club meetings, support young carers and give one-to-one mentoring for children, among other activities which take place in the building. Nearby St Andrew’s Church and Woking Sea Cadets, whose TS Dianthus base is in Goldsworth Park, have offered their premises for use by the youth service teams which use Lakers. Investigators do not know what caused the fire which put the centre in Denton Way out of action on Tuesday evening last week. The two Woking fire crews, backed up by an appliance from Guildford, arrived at about 5.50pm to find part of the roof burning fiercely and immediately called for three more engines and an aerial ladder to be sent. “There were multiple calls to the fire service so we knew it was a working job,” said Watch Commander Matthew Richardson of Woking’s red watch, who was in charge at the start of the incident. He added that the firefighters, working inside wearing breathing apparatus as well as from outside, used several water jets to quickly bring the blaze under control and stop it spreading to the centre’s hall. Crews worked for more than two hours to make sure the fire was completely doused and an appliance was at Lakers throughout the night in case there was a further outbreak. At the height of the fire, Saint Andrew’s Church opened its coffee shop to provide tea, coffee and biscuits for firefighters and the Waitrose supermarket in Goldsworth Park donated food, which was delivered by members of the church. Store manager Matt Bull said the supermarket was very happy to provide help when there was such an incident in the area.